Saturday is my favorite day of the week. It’s the one full day that doesn’t have work as part of it, or work to prepare for the next day. Sure, it may be jam-packed with things to do fun or otherwise, but it’s a full day. I can sleep in if I want, I can stay up late, I can get stuff done or do nothing at all! Well, nothing at all isn’t really an option, but…a girl can dream, right?? And of course, we can’t forget that it’s also Sammich Saturday! It is pretty much my favorite kind of food, and all. I can’t believe it’s been 7 months since the last turkey burger post! I pretty much love burgers in general, but I really love when I find a good turkey burger, and this is definitely one of those. 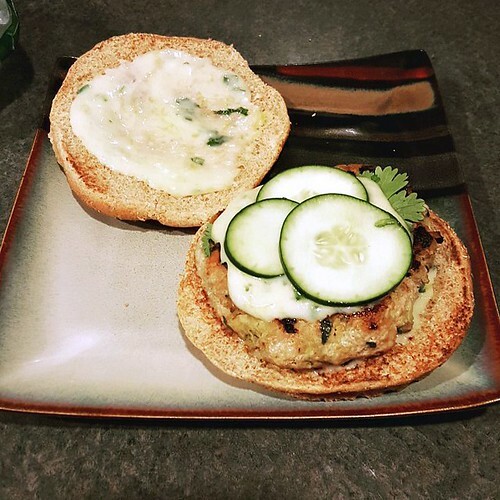 Turkey burgers with an extra, healthy surprise inside, topped with a creamy mango chutney yogurt sauce, cilantro, and cucumber slices. Yes, I said cucumber slices. And yes, I thought that was weird when I first saw it, too. But they are crisp and refreshing, and it goes perfectly with the other flavors. Oh, and the sauce is pretty good to dip sweet potato fries in too. Just sayin’. Healthy, juicy, delicious turkey burgers with Indian-inspired flavors and mango chutney yogurt sauce…how can you go wrong?? In a large bowl, combine the turkey, zucchini, curry paste, chopped cilantro, garlic, salt, pepper, and ginger. Using your hands, mix well and divide into 4 equal sized patties. Heat a large skillet or grill pan over medium-high heat and spray with cooking spray or drizzle a teaspoon of olive oil in the pan and swirl to coat. Add the patties (in batches if necessary) and cook for 3-5 minutes per side, or until cooked through. Repeat with second batch, if needed. Meanwhile, in a small bowl, combine the Greek yogurt, mango chutney, and chopped cilantro for the sauce. Stir until well-combined and set aside or refrigerate until ready to use. Once the burgers are done, toast the buns and spoon a little of the chutney sauce on the bottom buns. Top with a burger patty, more sauce, a few cilantro leaves, and a few cucumber slices. And more sauce on the top bun, if you’d like!